If there was an award for pluckiest theater in the South Sound, West Pierce County’s Paradise Theatre would be the hands-down winner. 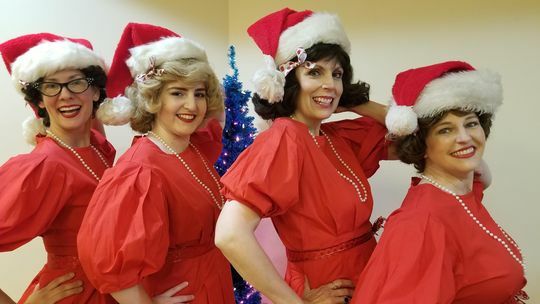 Priced out of its previous home in downtown Gig Harbor, Paradise is staging A Taffeta Christmas at two different halls this month. From now until the end of the month this show can be seen at Rosedale Hall, as the Paradise brass and board try to find permanent, or at least permanent-ish lodging. Paradise’s plight ought to make them down in the mouth and dispirited, but that isn’t the case. In fact, Paradise Theatre doesn’t want you to feel sorry for them. Rather, they want theater-lovers in the South Sound to APPRECIATE them, and they deserve all of that and more. One would imagine that these trying times would make it hard to put on a good show, but that isn’t the case either. A Taffeta Christmas is singing, dancing, and a surprise or two. It is a lovely lid-lifter to the Christmas season. Written and arranged by Rick Lewis, and directed locally by Vicki Richards, A Taffeta Christmas presents four local gals from Muncie, Indiana who have earned a measure of acclaim on a national basis, circa 1956. Oh, they aren’t about to hit it big on Ed Sullivan. However, they’re singing The Star Spangled Banner at the roller derby. So, there is that. The four girls return to their hometown for a Christmas special in the Moose Lodge, and the earnestness is palpable. The girls, Cheryl, Kaye, Donna, and Peggy, left to right as the show opens are played by Madelyn Bjorn, Chelsea Pedro, Shannon Burch, and Diane Daniels respectively. The show within a show offers each performer an opportunity to take the spotlight, as well as chances to sing splendid tight four-part harmony. Individually, the ladies sing well, but it is while singing in harmony that these performers are at their best and when the show hums at its best. However, there is more going on than four girls singing. As the show moves along we get to see the individuals emerge. Donna is wacky perpetual motion, a comedienne trapped in a white-bread Supremes act. Cheryl wistfully recalls her days as the high school beauty queen. Kaye longs to take charge. Peggy gets lost in her own world and in her costume change. Each actress plays her role to a tee, and A Taffeta Christmas is a lovely start to a holiday season we all need, after a year that seems to have lasted at least 15 months. This is a show that deserves to be seen, housed by actors who deserve applause. The bottom line to A Taffeta Christmas is this: Mses. Bjorn, Pedro, Burch, and Daniels are great! Saturday night’s “Warren” needed acting lessons, a facelift, and counseling. South Sound community theaters all over the place are asking for help and, indeed, they are deserving. That said, none of the others will disappear without help, and Paradise Theatre might. If a year from now, the South Sound doesn’t include Paradise Theatre, we will all be poorer for it. So, if you are within the reach of Drama in the Hood’s long arm, please consider being an angel for a deserving operation. Community theater is a vital heart that pumps lifeblood into society. Don’t allow the heart to stop and the west Pierce body to lose part of what makes the area livable. At a bare minimum, buy a ticket to A Taffeta Christmas. But, this isn’t the season for minimums. It is the season for miracles. “A Taffeta Christmas,” by Rick Lewis. Paradise Theatre, Rosedale Hall,8205 86th Ave NW, Gig Harbor, 98332. Fri-Sat 7:30, Sat 2 pm through Dec. 8. Tickets: paradisetheatre.thundertix.com/events/140425 Info: paradisetheatre.com, or P.O. Box 4, Gig Harbor, WA 98335.